Honestly, I don’t have much insight in to why a restaurant receives Michelin stars or not, or has them taken away or any of that nonsense. I know they are good thing for the restaurant business and they are the standard bearers for fine dining in France and across the world. Marea evidently has a couple of them. We’ll leave the ratings to the official critics, but I’ll be glad to share what it was like to eat there from the guy who wanted langoustines. Luckily, NYC has a few Michelin-rated restaurants, and a 40th birthday was an excellent reason to get gussied up and gander at the Goldman Sachs’ crowd on Central Park South and eat Micheal White’s food. 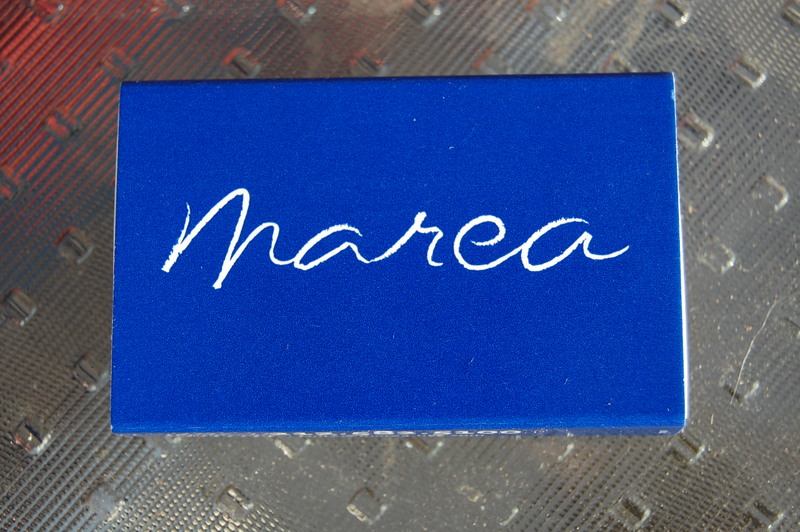 Let’s be clear: All of the food at Marea was excellent. The service was very good. The wine was fantastic. The menu was extensive, if not overwhelming, and the outcome was a definitive nod of the head and two hitchhiker thumbs up. There were four of us, and we all opted for the 4 course prix-fixe where you get to choose either a crudo (raw prepared fish) or appetizer, a pasta or risotto, an entree and a dessert. Going with four people was a great idea as we were able to taste everything and try the full spectrum of flavors. I opted for a grilled octopus app, the seafood risotti, and langoustines for the entree. I was incredibly happy with my choices, though next time (when I’m 80) I am absolutely getting a pasta because what I tasted from my other three dining companions was so freaking good. In fact, if I could go and sit at the bar and eat only a pasta and a glass of wine it would be a nice little meal. But beware of the crowds. It was jammed on a Wednesday night and it’s the kind of place that a Martha Stewart and a Fran Lebowitz dines in. We saw Martha last night after we were seated and she was up at the host area. Two tables over from us was Fran Leibovitz who bumped in to my chair on her way to a smoke outside and said “Sorry.” I didn’t see her behind me, but I thought it was the voice of a man until she passed by. It was so husky it reminded us of one of Marge’s sister’s on The Simpsons. The amuse bouche was a clear butternut squash shot with a touch of chili and a piece of yellow squash in it. It was savory liquid with a little sweetness and spice, but not amazing in the least. We started with a little crostini of sea urchin with a thin slice of lardo and sea salt on top. It was warm, orange soft serve sea cream with a touch of pork fat. This was a sweet precursor of things to come. Nice start. The octopus was smoky, meaty and cooked to perfection at slightly underdone so there was firmness at the edges, but soft in the middle. It was served with purple and white fingerling potatoes, some pickled red onions, radish, and a little bit of crisp frisee lettuce underneath with a touch of aged balsamic that was either grilled for a second or warmed by the octopus, but it had a nice char flavor with a tiny acid zip. This app was perfection. Everyone else had crudos which were nice and clean tasting. I tried the razorclams with chilies and a touch of fennel. It was good, but everyone seemed to think the grilled octopus was the winner. Everyone got multiple tastes of fine since it was a bit more substantial than the crudos. It was a standout. The risotto had tiny bits of lobster, scallops, rouget, shrimp and was buttery and creamy; it leaned to the heavy side of the meal, but it was nowhere near as good as the pastas that everyone else ordered. There was octopus and bone marrow in a tomato base over fusilli which was rich and delicious. There were clams, calamari and chilies over ferratini–a long pasta, which was clean and lovely ocean tasting with a touch of spice. My favorite of the pastas was the orecchiete with prawns, chilies and rosemary in a light, but flavorful tomato sauce. The quality of the pasta was incredible. We were all very impressed by the full taste of the noodle and the freshness. The langoustines were seared with the shells on and had that sweet sea meat flavor similar to lobster or a really good prawn. “Oh, man, that is good. It’s like lobster dipped in sugar,” said the man who ordered a steak at an Italian seafood restaurant. We spied a steak at the bar while we were waiting for our table and it did look amazing. So one of us ordered it, and, as Kerry said, that might have been the best meat she’s ever tasted. I agree with that sentiment. It was 50-day dry aged sirloin with cubes of toasts soaked in bone marrow. It was tremendous. The ladies had the halibut which was good, but a tad dry for me, but that happens so often with white fish after its plated that it’s difficult to fault anyone. The restaurant decor was rather Velveeta and not my thing with big ocean shells on small mounts by the windows and a brightly-lit biggish room for NYC. I did, however, like the earth toned marble-back lit bar area. The chairs at the dining table were a combination of mismatched leather zipper lounge chairs on two ends and freestanding upholstered metal end chairs that had a little bounce. The plates on the table when we sat down were cheesy, shelllike silver and white jumbo sized things with the scripted name of the restaurant. Ugly and overdone like most of the room, but writing about this I feel a little guilty I really only care about the food, and there was no disputing its dominance. The first white we drank was a Moscato which was crisp, with peach notes on the nose, but not overly fruity at all. We forgot the name of the second white, as we were fairly lit up at this point, but it was drier and smooth. Basically, if you go here, talk the sommelier. He did not disappoint. Desserts were chocolate cakes, chocolate mousse with flor di latte gelalti and a trio of sorbets and gelati. The concord grape and carmelized pineapple sorbet were smooth and fruity and refreshing. Oh, and when we walked out, they handed the ladies little bags of muffins. “From the pastry chef,” said the smiling host as she thanked us for coming. This entry was posted in Uncategorized and tagged Fran Lebowitz, Marea, Marea NYC, Martha Stewart, Michael White, Michelin Stars. Bookmark the permalink.